CSPDigital's latest issue takes a close look at what's happening in the c-store industry's most important, and most challenging, category. Legislation, supplier divestitures and acquisitions, new product development, market share shifts – you name it, it's taking place in the tobacco category. 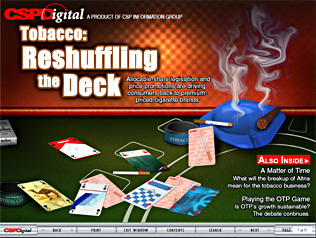 Reshuffling the Deck: A drastic reduction in the relative price gap between first and fourth tier cigarette brands has gone a long way toward creating a more level playing field . A Matter of Time: Philip Morris USA likely will soon be spun off from the Altria Group and become its own company. What does that bode for the tobacco industry? Playing the OTP Game: MST continues to grow, but what does the future hold?